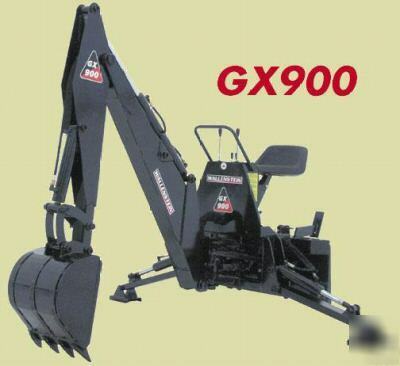 Brand New Wallenstein Model GX900 Skidsteer Mounted Backhoe. This is a Great Backhoe for 30-100 HP Tractors. * Fits all Skidsteers with the New Universal Skidsteer Quick Attach. * Price includes Skidsteer Mounting Brackets, a 12" wide bucket & hydraulic hoses. It is Complete & Ready to use! * Black is the most commonly available color. Green, Blue, Red & Orange are available, but subject to special order delays. * Transport Weight - 1200 lbs. * Digging Depth (2 ft flat bottom) - 9 ft.
* Overall Operating height - 13.5 ft.
* Reach from Swing Post - 12 ft.
* Stabilizer Spread Operating Position - 8 ft.
* Dipper Boom Digging Force - 2600 lbs. * Bucket Digging Force - 4100 lbs. * Boom Lift Capacity Appr. - 1200 lbs. * Bucket Sizes available 9", 12", 18", 24"
* Main Boom Cylinder Diameter - 3"
* All other Cylinder Diameters - 2.5"
Plus, we are glad to say, Wallenstein Backhoes are manufactured in North America and are Extremely well made, and affordable Backhoes!! !